The cast (of Ballers) is terrific and work well together. (Dwayne) Johnson is obviously in his comfort zone and his acting is better for it. So many times when you see a movie or television show about Major League sports, there is a common theme running throughout...Babes, Booze and Bling. 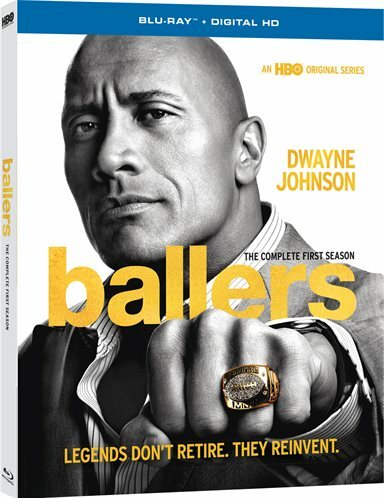 HBO's hit series, Ballers, has plenty of all three, plus something extra thrown in. Spencer Strasmore (Dwayne Johnson; Furious 7) was a world class football player who had a great career. Like so many former star athletes, the transition to "real Life" has been a rocky one. Spencer now finds himself as a financial analyst and unofficial "Papa Bear" to other young Football stars. As with real life, these players have great wealth, posses full of childhood friends hanging on to the guy with all the money and women all over them. They need help navigating the waters and Spencer is there. Ricky (John David Washington; Malcolm X) is a hotshot, hotheaded star with daddy abandonment issues and a lust for life. Joe (Rob Corddry; Hot Tub Time Machine) is a mid-life crisis in full swing, but, as Spencer's mentor and cheerleader, he teaches Spencer the ropes of being a financial analyst. Vernon (Donovan W Carter in his acting debut) is the hottest thing in the league right now, renegotiating his contract with the Dallas Cowboys Franchise and who has surrounded himself with his money-sucking posse. These are Spencer's people. The production value of this series is top notch, which may be the reason there are only ten episodes in Season one. Sports cars, yachts, bling, booze and high-end locations don't come cheap, and that doesn't even begin to touch the wardrobe. The writing is also on par with some of today's other hit shows, so there was no slouching when it came to bank rolling this product. These touches, though, are part of what makes the show believable. The cast is terrific and work well together. Johnson is obviously in his comfort zone and his acting is better for it. Although, I wonder how much of it is acting and how much is drawing on personal experience as a former football player. Corddroy is a great choice as Spencer's sidekick since he seems to compliment Johnson well. The young men who portray the various football players are a mixed bag, but seem to do well enough. Richard Schiff (The West Wing) as the owner of the financial analyst firm, is smart, smarmy and straightforward, which makes you want to love him and hate him all at the same time. The Blu-ray is presented in 1080p High Definition video with a 1.78:1 aspect ratio. The quality is excellent and the colors are sharp and vibrant which accentuates the beautiful South Florida scenery. The audio is DTS-HS Master 5.1, which works well for not only the dialogue but also the soundtrack, which highlights some of today's best Hip Hop/Rap music. The extras on the disc are really just a recap of each episode with a "look inside". I was hoping for more in that sense and was a little disappointed. Some featurettes discussing the making of the season, location shoots around South Florida and perhaps some cast interviews, especially with Dwayne Johnson would have be a welcomed addition. Regardless, the viewer knows going in they aren't buying the disc for the "extras" (since they are listed on the packaging)in this case this case and should still invest in a copy of this well done show. HBO is known for quality programming and entertaining ideas and Ballers fits right into the mold. While a little clichéd, it still is interesting enough to make viewers want to tune back in each week. The writers make the characters engaging and humanizing in such a way that has the audience investing in their lives. They also add enough masculinity and sports to entice the male population while balancing enough drama in the storylines to keep females tuning in as well. Yes, it's been done and we've seen the young, rich and stupid routine before, but HBO captures it well and scores a touchdown with season one. We'll see if they can keep the momentum all they way to the championship. For more information about Ballers visit the FlickDirect Movie Database.